Seashells on the sand, peacocks in flowering magnolia trees, and butterflyfish in elkhorn coral. Thirty-one original designs present spectacular combinations of natural elements; from flora to fauna; in eye-opening, full-page patterns. Designed by award-winning scientific illustrator Patricia J. Wynne, whose illustrations have appeared in over 90 books! 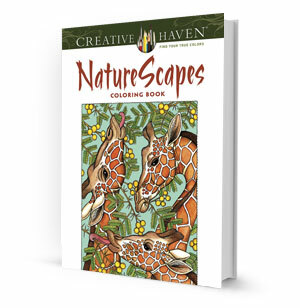 The pages in this book offer hours of challenging fun to all coloring book aficionados. Each page is perforated and printed on one side only for easy removal and display. Find your true colors and let your imagination run wild! Paperback: 64 pages.